Eye Exam VS Vision Screening…Tomato Tomahto? Home » Vision Therapy » Eye Exam VS Vision Screening…Tomato Tomahto? 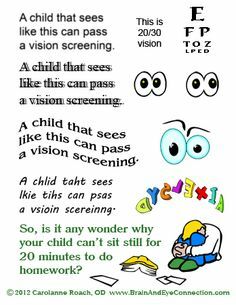 Is a vision screening the same as an eye exam…. or a “online eye exam?” This is a common question. Many schools and pediatricians perform vision screenings…does your child still need an eye exam in-person with an optometrist? The answer is 100% YES, because a vision screening is not the same as a comprehensive eye exam, and neither is an eye exam done online. Vision screenings at the school or pediatrician’s office are designed to detect obvious problems with SIGHT. As you have learned from our previous blog posts, sight is only one component of vision. Children who pass vision screenings often have vision problems that affect their learning. It is better to have an optometrist examine your child, and BEST to have a developmental optometrist perform the exam. This is because developmental optometrists, like our very own Dr. Jacobi, are certified in vision and learning development and test for vision issues that vision screenings as well as other optometrists often miss. Another important thing to mention, is that vision screenings do not check the health of a person’s eyes. A vision screening is the first step to detecting an issue, but a comprehensive eye exam with a developmental optometrist will provide you with much more information in regards to the performance and health of your child’s eyes. The American Optometric Association (AOA) recommends that children have their first comprehensive eye exam at 6 months old, and (providing that there are no issues), again at age 3, just before starting Kindergarten, and annually thereafter. Because we believe in the importance of this, we offer free comprehensive eye exams for children who are entering Kindergarten. Summer is a great time to schedule an eye exam for your family! Make sure that your children begin the school year ready to learn. Should your child need to begin vision therapy, getting a head start over the summer is very helpful! And don’t forget about yourself – whether you have a family history of eye disease, dry eyes, allergies, need specialty contacts or vision therapy – we are your friendly and knowledgeable eye care professionals.